Two events this week hosted by local school districts offer the public a chance to sample the joys of coding and cultural traditions. On Thursday, South Kitsap School District will host a public Hour of Code from 5 p.m. to 7 p.m. at South Kitsap High School. Doss Bradford, the high school’s computer science instructor, will open up computer labs to let community members try their hands at the increasingly important skill of coding. The event piggybacks on the recent Hour of Code events in which South Kitsap students (along with others around the world) took part. After the coding activity, the district will offer a free screening of CODEGIRL, a documentary, released in November, which follows female student teams in the Technovation Challenge. The Technovation Challenge aims to increase the number of female app developers by empowering girls worldwide to develop apps for an international competition. “We hope the movie will encourage girls in our district to give coding a try, possibly entering the Technovation Challenge themselves,” said Greg Kirkpatrick, the high school’s assistant director of career and technical education. 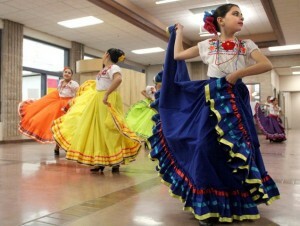 On Friday, Bremerton School District will host its second annual multicultural night. The Kitsap Sun covered the event last year, and it was a blast with students performing traditional dances from Mexico, Guam and other countries. There are ethnic foods to sample and other interesting presentations. It’s one of the ways the high school honors its ethnically diverse student population. The event is at 6:30 p.m. Friday in the Bremerton High School Commons. South Kitsap School District Superintendent Michelle Reid on Wednesday, July 15, will share her final recommendation with the school board on a plan to move ninth graders up to South Kitsap High School. The Kitsap Sun will cover that meeting and on the following day, at 7 p.m. July 16, I’ll host a live online chat with Superintendent Reid. We hope you’ll log on to www.kitsapsun.com to listen in. There will opportunity to comment, ask questions and take polls. The grade realignment plan has been under discussion within the district throughout the 2014-2015 school year. Other elements of the proposed re-shuffle include moving sixth graders, now in elementary schools, up to the junior high schools and converting the junior highs to middle schools. The district’s school boundary committee, convened at the start of the school year, recommends making the changes all at once, no sooner than 2016-2017 but no later than 2017-2018. The committee supported a small boundary change to go into effect in the upcoming school year, whereby about 65 students from the Wye Lake area will be reassigned from Sunnyslope to Burley-Glenwood School to address immediate crowding needs. Moving sixth graders to the junior high/middle schools will address longer term crowding, the committee concluded. Reid agrees with all that, but in a preliminary presentation to the board June 2, she recommended phasing in the grade realignment. 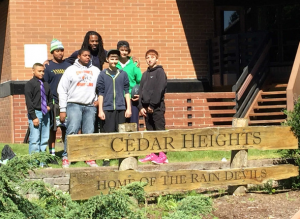 The changes should be implemented at one junior high each year, starting with Cedar Heights in 2016-17, Reid said. Elementary “feeder” schools for Cedar Heights are Sidney Glen and Sunnyslope, both of which are experiencing crowding. Under Reid’s plan, the phase-in would continue with another third of the district’s ninth- and sixth-graders moving up in 2017-18 and the rest in 2017-18. The order of the second two move-ups is up for discussion, she said. Reid said spreading the grade realignment over three years would make it fiscally and logistically easier on the district. The realignment would help the district address crowding at some schools and give students more developmentally appropriate learning environments, she said. Some parents and community members have raised concerns about crowding at the high school. Reid said she has received considerable feedback on the proposal, which she will address in her final plan on Wednesday. So, stay tuned. And while you’re waiting for the meeting coverage and online chat, feel free to send me your thoughts about ninth graders moving up to the high school, along with other aspects of the plan. Let me know if you are a student, parent or community member, and if you are willing to have your comments published. Last year, when Washington State lost its waiver under No Child Left Behind, South Kitsap School District teachers and administrators got together to give U.S. Secretary of Education Arne Duncan a message. Lip synchingIt came in the form of a rendition of Aretha Franklin’s “Respect” — as in all they want is a little — sung by music teacher Leslie Niemi, karaoke style, with lively backup from various school officials. Thus, they belted out their frustration with their schools being labeled as “failing” under NCLB standards. 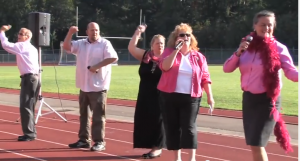 Teachers and school officials wiggled their hips and clapped to the beat. 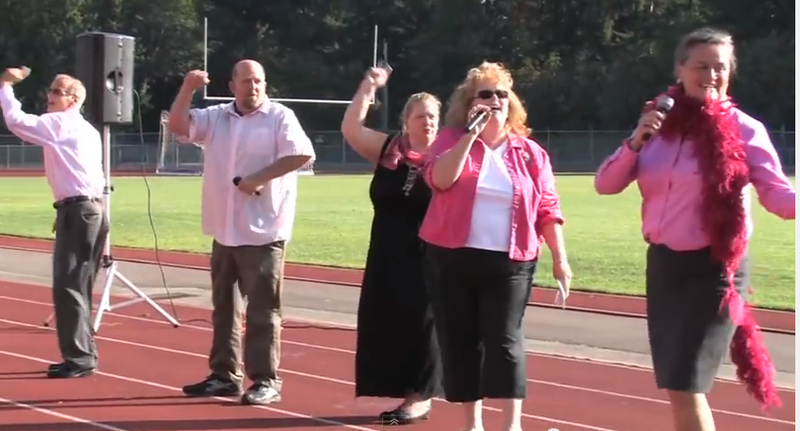 In the video, Superintendent Michelle Reid, usually staid and suited, cuts loose in a pink feather boa in the video by the high school’s production crew. Small wonder visitors to the website Our Kids Our Future made it third among the site’s top viewed posts from 2014, according to the Washington State School Directors Association, which does a roundup of education news from around the state and nation every week. Without question, the website draws an audience sympathetic to the district’s message. 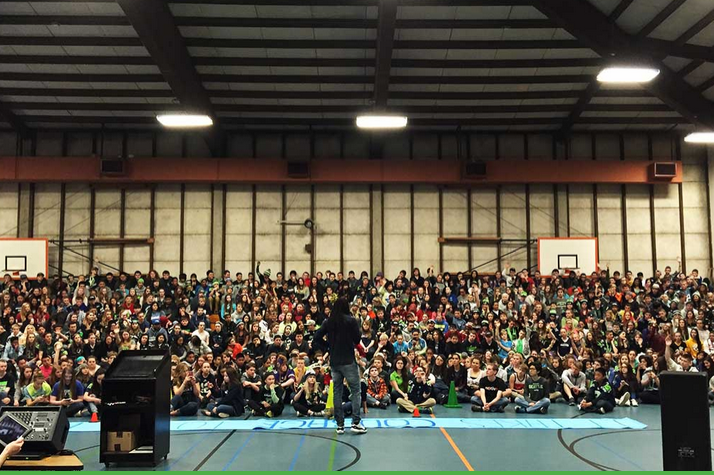 Our Kids Our Future‘s “campaign is led by a group of Washington education organizations, including WSSDA. 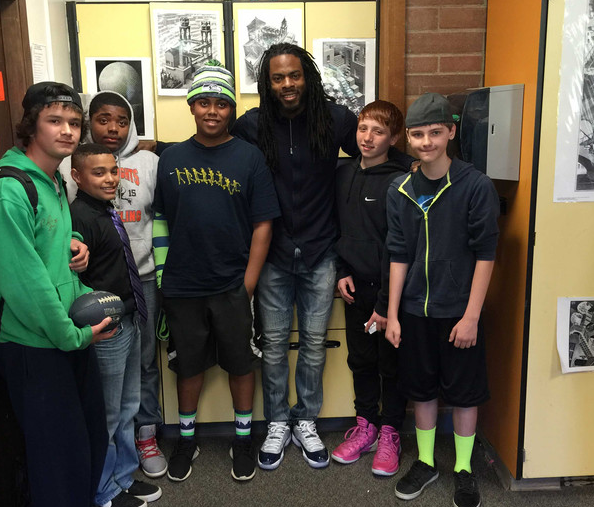 The goal is to highlight excellence in Washington State public schools,” according to its “about us” page. Partners include the state’s Office of the Superintendent of Public Instruction, as well as state associations of school principals, school administrators, the state teachers union, PTAs, school boards and others. Vested interests aside, pretty much everyone, including members of Congress, agree that NCLB was a good idea but flawed in how it was a carried out. Standards for all students, no exceptions, were ramped up over time until meeting them became all but impossible. In recognition, the federal government allowed a waiver for states whose districts were making “adequate yearly progress” toward the ideal. Washington lost its waiver this year when the Legislature — pressured by teachers and others — declined to support a teacher evaluation program relying on statewide test scores. That meant districts had to inform parents that their schools, some of which had recently earned recognition from the state, were “failing.” Schools that receive federal Title I money and which have been placed in one of five levels of “improvement” have to set aside some of their Title I allocation for parents who want their children transported to a different school or district, or who wanted tutoring outside the failing school. 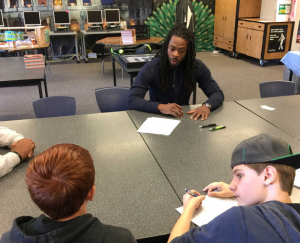 In a story we wrote in August, as districts tried to figure out the implications, I cited a letter Reid wrote to families in which she called the “fail” label “regressive and punitive.” Clearly, SKSD’s performance was designed not only to stick it to Arne Duncan — with a great sense of rhythm, no less — but as a moral boost for the staff. And for my money, no matter where you stand on NCLB, it’s always a moral booster to see a school superintendent in a feather boa. Wonder what they’ll do for an encore. The South Kitsap School District Board of Directors and legislators representing South Kitsap will host a forum on education at 5 p.m. Tuesday at Dragonfly Cinema, 822 Bay Street. For information, call the district office (360) 874-7001. I’ve brought this up before in relation to superintendent searches in South Kitsap. Here it comes again, sparked by the recent appointment of Aaron Leavell as Bremerton School District’s new superintendent. In 2008, the South Kitsap school board appointed then-assistant Superintendent Dave LaRose to succeed then-outgoing Superintendent Bev Cheney. Both LaRose and Leavell were well known to district constituents and well-liked by most. Leavell, like LaRose, has been the district’s assistant superintendent. But the SKSD board got some serious blowback for presuming that LaRose’s appointment would be universally welcomed. The board announced its intention to hire LaRose to lead the district and held forums so district residents could comment before making it official. Then-board president Patty Henderson said the board had heard LaRose was applying for the Bremerton superintendent position (vacated by Bette Hyde and eventually filled by Flip Herndon), and SKSD didn’t want to lose LaRose to another district. The tide of comments at the 2008 SKSD superintendent forums indicated a public slighted by the process. The overwhelming majority praised LaRose but said other candidates should have been considered, even if the intention was to hire from within. In contrast, the Bremerton school board was careful not to overtly express its intentions, although several comments by board members hinted at the direction they were heading. The BSD board held a community forum Aug. 30, inviting city residents to talk about the district’s needs and the search process in general. The overwhelming majority at that meeting clamored for the board to appoint Leavell. At the next meeting, the BSD board took their suggestion and welcomed Leavell with open arms. While none of the Bremerton board members mentioned LaRose’s appointment, it seemed to be hovering in the back of their minds. In comments made before the motion to appoint Leavell, board member Dave Rubio Rubie said he has taken note of “other districts” who have hired from within. To conclude this footnote, I think it’s fair to say that the controversy surrounding LaRose’s appointment didn’t substantially affect his tenure. Here’s Patty Henderson explaining the SKSD board’s thinking before it formalized appointment of LaRose. He is now in California, replaced this summer by Michelle Reid. South Kitsap schools appear to have dodged a bullet. Sorry kids, probably no extended summer vacation for you. The South Kitsap School District and its teachers’ union, which earlier this week agreed to strike over class sizes if needs be, reached a tentative agreement on a three-year contract late Friday. Today, as I sat in the district office, summoned for a 1:15 p.m. press conference with SK Superintendent Michelle Reid, I thought things could have gone either way. So I researched what might have happened if the district and the South Kitsap Education Association had not reached an agreement, given the teachers’ union vote to strike earlier this week if a contract were not approved. Districts can seek a court order forcing teachers back to work, as happened in the 2011 Tacoma teachers’ strike, I found. A 2006 opinion issued by then-Washington State Attorney General Rob McKenna said state and local public employees, including teachers, have no legally protected right to strike. State statutes establish no specific penalties against striking teachers; that’s up to the judge. Teachers, as in the Tacoma strike, have defied court orders. During a 2009 Kent strike, teachers faced the threat of a $200 per day court imposed fine, but a resolution was reached before penalties were imposed. Since 1972, court injunctions have been granted in 28 of 34 cases in which they were sought to end strikes, according to an analysis of data from the state’s Public Employment Relations Commission by the Freedom Foundation. In one case, union officials were jailed. The Freedom Foundation is a conservative think tank promoting government accountability. In Kitsap County, there have been six strikes or near strikes over the years, two involving court injunctions. South Kitsap was involved in one near strike in 1975. In 1974, Central Kitsap teachers had planned a one-day walkout before the contract was resolved. In 1975 in South Kitsap, there was a lockout of teachers by the district administration, delaying the start of school that year by three days. In 1977, Bainbridge Island School District was one of eight districts statewide with impending strikes. Bainbridge teachers defied a court injunction during the four-day strike. In 1978, Central Kitsap School District administrators hired replacement teachers, and school continued during a five-day strike, with no injunction. North Kitsap teachers were on strike for five days in 1986; there was no court action. The longest strike in Kitsap’s history was in 1994 in Bremerton School District. The district sought an injunction, which teachers voted to defy. An agreement was reached, however, before a court order was approved. South Kitsap teachers had support from students, who posted their thoughts via Twitter, at #wearenotsardines. And sure enough, shortly after 7 p.m., a joyful burst of applause erupted from one of the district office conference rooms, where bargaining had been going on, hot and heavy, since 8 a.m. The SKEA membership has yet to ratify the contract, but union President John Richardson expressed satisfaction in the agreement reached with concession on both sides. With the start of school less than two weeks away, administrators are keeping a close eye on class sizes and making adjustments to balance out the number of children in classrooms at each grade level. A class size “watch list” was the hot topic of discussion at last night’s school board meeting. The list, below and also available on South Kitsap School District’s website, shows grade levels and sections at each school that are overcrowded by standards of the local teachers’ union, the South Kitsap Educations Association. Some math and science classes at the high school show up to 40 students per section. Other areas of particular concern are East Port Orchard Elementary, where more than half the classes are near or at maximum capacity, and John Sedgwick Junior High, where most science and math classes are near, at or above the max. 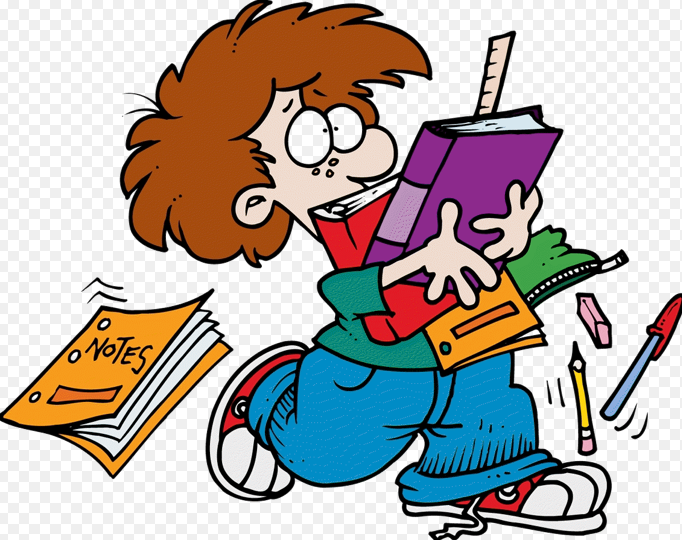 Take a look at the list to see where your child’s school and grade level stands. The watch list is in flux, as administrators try to balance class sizes, but South Kitsap is up against challenging budget constraints, entering the new school year with the largest reduction in force in recent memory. Sixty-one teaching positions were slated for elimination in May. The district got some enhanced funding from the state and made other adjustments, enabling some positions to be restored. (And the original RIF counted four positions twice.) The RIF now stands at 39.5 FTE teachers, according to finance director Sandy Rotella (although the budget document reviewed at last night’s meeting says 42.8 positions). Certificated staffing (teachers) will drop from 617 last year to 575 this school year, for a projected enrollment of 9,086 students, according to the posted budget. So some increase in class sizes is inevitable, especially at the secondary level, where classes have previously been staffed more generously than the teachers’ contract calls for. The teachers’ union is in the midst of tense negotiations. Members are supposed to vote on a contract on Monday. But class sizes have become a sticking point. At last night’s meeting Superintendent Michelle Reid outlined the district’s dilemma when it comes to balancing class sizes and teachers’ pay. Eighty-five percent of the district’s budget is for personnel, said Reid, so one way or another the number of people times the amount they are paid must equal 85 percent of revenues. The district and the union must strike a balance between more teachers and higher pay, Reid said. There is some funding that may be allocated for additional positions, but the district is proceeding cautiously, she mentioned. Teachers receive monetary compensation for each class with students over the maximum, but without exception, all would prefer to skip the bonus, said John Richardson, union president. The challenges of more students in each class and a higher workload outside the school day are some of what is driving good, competent teachers out of the profession. I know of several colleagues who have left SK in the past years (many of their positions have NOT been filled) and our department and school are poorer without them. Karen Little a counselor at John Sedgwick Junior High School, said the concept of average class sizes is misleading, because some like special education are as low as 12, pushing the allowed average maximum up well above 30 students. Tasked with assigning students to classes, Little is struggling. “I feel like I’m playing chess and somebody’s given me a quarter of a board, and I can’t move anything” Little said. Chris Lemke noted that the number of students in elementary schools varies. Some schools are crowded; others are below capacity. Lemke said the board recently began talking about ways to even out the distribution, either by moving students to a different school or re-drawing district boundaries. If any of that happens, Lemke said, it won’t happen quickly. Reporter Steve Gardner is working on a story about how students are assigned to classes. It’s set to run Tuesday. Recent rain reminds us that summer is winding down and the start of school is near. South Kitsap School District will host its annual Back-to-School Celebration from 11 a.m. to 2 p.m. tomorrow (Aug. 17) at the South Kitsap High School track. Free, free, free, school supplies (one package per student) bus rides, refreshments, art projects and games. You can even get a haircut. Visit booths hosted by schools and community organizations and enjoy performances by local musicians. All students should be accompanied by an adult. Some students at South Kitsap High School had planned a walk-out protest of the district’s plans to eliminate 68 positions, including 61 teachers’ jobs, Principal Jerry Holsten said Monday. Holsten’s comments confirmed some chatter the Kitsap Sun heard via its Facebook page earlier in the day. Morale at the high school (and throughout the district) is low, given the school board’s decision last week to make plans for its most sweeping layoffs in recent memory. The students had apparently planned a sympathy strike by walking out on classes. Although the state Legislature plans to pump additional funding into the K-12 education system, the budget is far from finalized. Whether or not some or all of the jobs will be saved is a big unknown. The board is required by law to notify teachers who will be RIF’d, giving them adequate time to seek other jobs before the next school year. The board on May 8 elected to stick with the regular May 15 deadline (that’s Wednesday), instead of going with an extension to June 15, approved by the Legislature at the end of the regular session. One board member said it was a courtesy to teachers possibly facing layoffs, since June 15 would give them little planning time. A total of 25 staff members have said they will retire or resign at the end of this year, so the number of proposed layoffs is 43. The RIF list includes 3.3 administrative FTEs: 1.3 at the district office, an assistant principal at the high school and one elementary school assistant principal. An instructional specialist, part of a school nurse position and 4.088 classified or non-teaching support positions make up the rest of cuts. To add to the stress, documentation is due this week on the state’s new method of evaluating teachers and principals, called TPEP, for Teacher/Principal Evaluation Project.